For a detailed discussions about the use of ICT in schools please refer to sections 4 and 7-11 of the Meta-Analysis Report. The ICT Innovation Framework (ICTIF) is a potentially useful tool to help teachers reflect on ICT use within school. The framework is discussed in depth in Sections 4, 8 and 11 of the NP3 Meta-Analysis Report. The ICTIF covers three aspects of ICT use by children in schools: Quantity, Focus and Mode. These are illustrated below, by focussing on key questions that teachers need to ask themselves about their children's use of ICT in school. The Quantity of use may vary depending upon the curriculum area and also between teachers. In one of the study schools, Stepside, children in one Year 6 class used ICT for up to 50% of the available school time, whilst in a colleague’s Year 2 class the children used ICT a great deal less (up to 10% of the available school time). Is ICT mainly used solely by the teachers (e.g. using the IWB to display information to the class)? (The teacher’s use of ICT should not be included in the estimation of the Quantity of use). If ICT is being used for coding/programming (e.g. using Scratch or Beebots) the Focus is teaching about ICT (Computing). 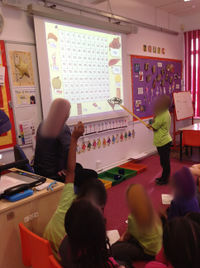 ICT may also be used as a reward for good or improved behaviour, or for other reasons not directly connected with the curriculum. According to the ICTIF, the Focus for these uses would be ‘Other’. See Table 4.4.2. in the Meta-Analysis Report for the range of uses in the NP3 study schools. Is ICT being used to support learning across the curriculum (i.e. in subjects/domains other than Computing)? If so, it falls into the category of Pedagogical use of ICT (PICT). 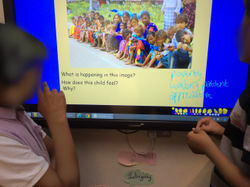 In Stepside, Ms Harrison was sensitive to the fact that some of the children in her class did not feel comfortable contributing verbally to group discussions, but she was keen to engage the children in collaboration and discussion. She planned a ‘silent discussion’ involving the use of three large touch screen devices and three discussion activities which facilitated verbal discussion but also enabled less confident children to contribute through written comments. For more detail refer to Section 4 of the Meta-Analysis Report. In Coast Primary, a Year 5 class used ICT during a six week period when working on a topic about Ancient Greece. The pupils used Garage Band to compose a piece of music which portrayed the atmosphere of the journey Theseus made on his return to Athens. Initially the girls, who worked individually on their iPads, researched classical music with a sea theme. They then created audio samples using physical instruments in the music room – this took two weeks. Next they used Garage band on their iPads, importing their sound samples and using the composition tools within the app. Once the music was completed it was exported into iMovie and images sourced from the Internet were added. The final movies were then uploaded to YouTube. Questions to ask: 1. What impact is the pupils’ use of ICT having on the curriculum? If the curriculum is fundamentally unchanged then the Mode is Support. If the curriculum is changed then go to question 2. 2. What impact is the pupils’ use of ICT having on how you teach (your pedagogical approach)? If how you teach is fundamentally unchanged, but is more efficient or engaging, then the Mode is Support. If how you teach is changed then go to question 3. 3. Could the change in what and/or how your children are taught have been achieved without ICT? If the change to what and/or how the children are taught could have been achieved without ICT then the Mode is Extend. If ICT is essential for what/how the children are taught then the Mode is Transform. For more detail refer Section 7 of the Meta-Analysis Report. This page was last modified on 29 June 2017, at 11:25.